At the first Order meeting, while inspecting the trees to make sure that they are healthy, Phillip discovers an orange ribbon tied around a tree's trunk. What could it be for? That's the question they both have. Little do they know, when the newspaper comes out it won't take long for them to figure it out. The paper, the one that Philip takes no notice to when he drops it on the floor, has the headline: "Demolition for Woods Planned for this Saturday." When the news breaks, Cedar is in the hospital, and there's nothing they can do about it. Once Philip reads the newspaper headline, he thinks that cutting down Stella might be why Cedar ended up in the hospital. Philip, being the intelligent child he is, devises a plan involving Cedar, the hospital, a getaway driver, and a protest. Will it work? 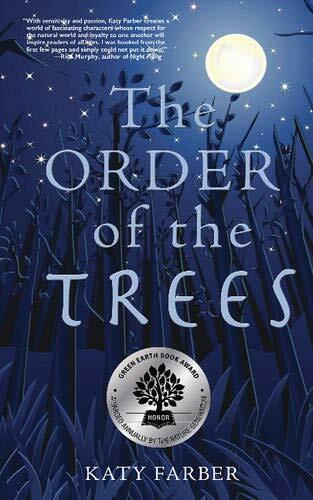 I think that The Order of the Trees is a heartwarming tale about how friendship could save someone’s life. It would really be good to read for people with disabilities, because this story teaches you that it’s okay to be different, no matter what others think about you. There will always be that one person, that one special person, who can bring out the best in you, no matter how afraid you are to show it. This book is a great fiction read-aloud for fourth and fifth graders. In my opinion, every library should have this book. Every single day after school, I would rush to the computer to read the next couple chapters. If you don’t believe me, read it for yourself! !